As technology evolves and the use of photovoltaic generators becomes more widespread, the use / dependence on electricity are becoming increasingly clear. With solar panels being installed with increasing frequency in the USA, Europe, Asia and remote locations of Africa and South America, demand has never been higher. Photovoltaic energy results from the direct transformation of sunlight into electrical energy through cells made of silicium, which is interconnected, to make up a module or solar panel. 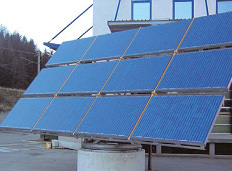 Each module or solar panel is sealed during manufacture with some form of single or two-component adhesive, Elastomer, or sealant component, which is dispensed into the aluminum framework. Until recently this process has generally been applied manually using adhesive or sealant cartridges. 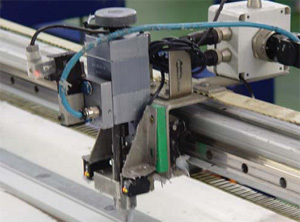 However, manual cartridge application of adhesive or sealants can sometimes lead to quality issues as the flow rate of the single or multi-component adhesive or sealant is difficult to control precisely when using a manually operated cartridge gun. In order to overcome such potential problems, automating the process, is the most effective solution. Kirkco provides complete system integration for total process control. From the proper material supply unit to precision multi axis robots and automation. Improved manufacturing process, typically result in the elimination of the cleaning operation previously undertaken following assembly of the frames, as well as a further cost saving in material due to the precision metering and dispensing control. By selecting the appropriate supply solution, Kirkco systems allow materials to be purchased in 200 liter size drums, which not only affords the maximum period between drum changes, thus causing minimal disturbance to production, but traditionally generates considerable cost savings on the purchase price of the materials in a price per pound or Kg basis. Pneumatic driven reciprocating pumps or precision gear metering pumps, supply the material directly from their original containers. With optional Low level and pressure sensor alarms material availability for the metering unit is assured. Through its frequency-regulated actuation, the metering unit ensures that the flow of material is adjustable, continuous, and uniform. The flow of material is monitored by a precision volumetric flow meter. The flow meter pulse generator is recorded and evaluated by the PLC control unit. A pressure sensor is integrated into the material line to perform a further monitoring function. This sensor registers fluctuations in the pressure, which are also evaluated by the PLC. PLC Processor pattern control unit provides a programmable dispensing function to the applicator valve. This allows for the storage of separate volume and dispense rates for different products. The dispensing module is designed for use in form-in-place gasketing, bonding, and sealing operations, with heated or unheated materials. Mounted on the arm, wrist, or end of standard industrial automation, the dispensing module meters materials close to the point of application. This close proximity minimizes the effects of supply system pressure variations, material viscosity changes, and drops in system pressure due to material output. The dispensing module achieves precise bead profiles, precise shot weights, consistent gasket sizes, and material savings. Material can be supplied to the dispensing module by any positive-pressure material supply system. Positive-displacement, pumps are linked to a closed-loop control device which provides precise volumetric output. Synchronization allows material flow to remain proportional to speed, assuring uniform material dispensing. By utilizing a complete adhesive dispensing system and integrated automation platform, to apply adhesive, sealant, or Elastomer close to the point of material application, the variation in bead size and placement is eliminated with a faster production speed. A new Kirkco system typically resulted in the elimination of the cleaning operation previously undertaken following assembly of the frames, as well as a further cost saving in material due to the precision control of the dispensing. Automatically applying the silicone sealant for solar panel manufacturing. Kirkco utilizes state of the art technologies and engineering in order to offer customers the optimum custom designed automation solutions. 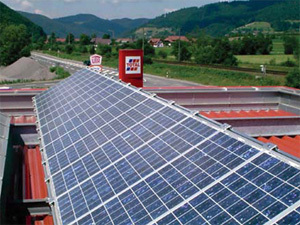 With the current energy crisis being experienced world wide, the increased need for alternative energy is on the rise. Because of the demand for increased output, automated production of (photovoltaic generator) solar energy panels is on the rise. During manufacture, it is necessary to seal the panels for protection from the elements. For this purpose, two component or single component sealants, adhesives, or silicones are typically utilized. Typical applications involving two component silicone sealant such as Elastosil SG500, supplied by Wacker are chosen as an appropriate product for this type of application. The system designed involves complete understanding of the application and the appropriate metering and dispensing equipment to applying the sealant to the panels. Depending on the level of sophistication selected by the customer, Kirkco can provide XYZ tables (3 axis unit) up to six axis robots. The appropriate application equipment is then selected to apply the adhesive, sealant, or Elastomer to the product. A single component gear metering head, precision fluid control device, or twin dispensing valve fitted with a static mixer is mounted on the automation equipment for a precision adhesive dispensing application solution. In the application of two components materials, both components are proportioned at a precise ratio by volume and fed to the robot arm by Kirkco's metering and mixing machine. The system used for this application is based on the material being processed. Complete system design ensures that close control can be exercised over the flow rate and mix ratio of the mixed material. These two criteria are the most important elements in determining the exact quality and size of the adhesive bead applied to the panel. Kirkco's two component adhesive and sealant metering and mixing equipment is particularly suitable for sealing and bonding applications where a continuous supply of viscous media is required. The base component is fed directly from standard open topped 55-gallon (200 liter) drum, while the hardener is fed from smaller, 5-gallon (20 liter) pails or pressure pots.